Last week I visited the Wrexham Warehouse Project. I had a thoroughly enjoyable few hours in this project. George Powell was a foster carer for 20 years alongside his work as a builder with his own family firm. He has since built a young people’s training centre alongside the firm, which became a charity in 2014. 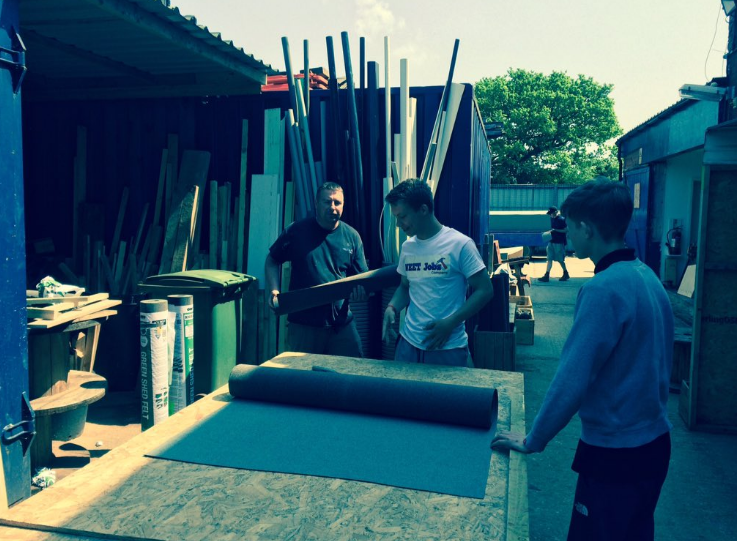 A warehouse on an industrial estate outside Wrexham provides daily training for young people in building skills – including carpentry, plastering, brick-laying and decorating. There is also a kitchen, laundry, art room and games room. The conversion of the building was done by young people in 2011 with the support of the project workers and it was officially opened by my predecessor, Keith Towler in 2013. There are awards and newspaper clippings around the place, showing that many of the young people have taken part in charity fundraising, football tournaments and the like. The project also has housing for some young people in the town, and is currently trying to raise money to purchase the historic Miners Rescue Centre in Wrexham which they will restore, providing young people’s housing and jobs in the town. The project works with young people who need a more supportive and flexible environment before being ready to start a college course, apprenticeship or job. Many have lived in care or are homeless and some need to be diverted from getting involved in crime. Others simply couldn’t get on in school in a classroom environment. Although this is a unique project (not every town has a builder-foster carer-youth worker with so much energy and commitment as George Powell and his team) there are aspects of the project that can, and to my mind should, be replicated elsewhere. First, the project has flexibility. They help young people who need them. They may be care leavers, homeless or excluded from school, but they don’t have to fall into neat categories to join the project. Some young people with learning disabilities attend – there was an art class going on when I visited. The project also doesn’t have a time limit. They recognise that it takes a long time for some young people to learn to trust others and build enough self-confidence to start to turn up. And it takes even longer for some to learn to turn up on time, stick to some basic rules, and work hard. I met a young man at the project whose local authority funding to attend the project had run out but he was still attending (and being paid an allowance) until the next opportunity turned up. Secondly, the project is skills based. There is a big emphasis on doing. This not only teaches skills for work, but also builds self-esteem. As all youth workers know, it can also be much easier to talk about yourself and especially your problems while side by side doing an activity than when sitting in a counselling room. Thirdly, the project recognises that housing is a real problem and the building firm behind the project renovates or builds flats and houses for rent by the young people. Plans for young people to get involved in this building work in the next ambitious project to convert a listed building to a small museum and arts-space with on-site bedsits and flats will mean that the young people will have a real stake in the homes they have built – emotionally as well as physically. The young people are not simply learning building skills in a college-type environment. They can see the value in what they are building. The project has health advice, arts, leisure, cooking, sports and voluntary work available. The foundation skills being taught are accredited. This is almost a one-stop shop for young people who need all-round support. Finally, although I was only in the project for a few hours, I could see the significance of the relationships in the project. There was easy-going banter as well as respect for the workers and volunteers who have authenticity due to their local knowledge and skills. There is trust here – something I have written about previously when discussing successful community social work (‘Slow Social Work’) in another ex-mining community in south Wales. Like many people with passion and drive, George is the first to admit that he sometimes rubs local statutory services up the wrong way because he does what he thinks the young people need, not necessarily what fits with the desires of commissioners and grant-givers. However, the young people he is working with need help precisely because conventional services have not suited them. I would love to see more projects like this, providing real occupation and restoring the esteem and self-worth of young people who have much to give, if given the right chances.